Odisha is a state which is located on the eastern coast of India. It is one of the well-known education hubs of the country. The capital city of Odisha is Bhubaneswar. It is home to a number of institutions which imparts quality education to the students. Odisha is famous among the students to pursue professional courses such as engineering, pharmacy, medical, law, etc. Students come from different places of India to join these courses. The literacy rate of Odisha is 73.45%. 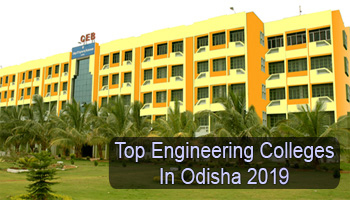 Students can check this article to get detailed knowledge of Top Engineering Colleges in Odisha 2019. For admission to the B.Tech & B.Arch programme, students will appear for JEE Main which is a national level entrance exam. The state government will also conduct the admission procedure by the name of Odisha Joint Entrance Examination (OJEE). Students will apply for this admission procedure on the basis of JEE Main scorecard. Candidates those seeking admission in IITs have to clear JEE Advanced examination. If you have any other queries about Top Engineering Colleges in Odisha 2019, you can leave your comments below in the comment box.